That’s it! Thank you so much – please drop me a note by clicking here and let me know what you think! What Qualifies you to represent the citizens of District 6? I believe the most important qualification is understanding the proper role of Government in a free country, and that elected officials are employees of the people. I’ve knocked on thousands of doors in our district to talk directly with my bosses about their priorities, our shared values, and possible solutions. I evaluate policies and budgets through the lens of 17 years of business and finance experience to ensure tax dollars are spent effectively and are achieving the desired outcome. I am honored to have been elected 3 times to serve District 6, and have been elected to leadership positions by my colleagues for the past 4 years. It’s important to realize Government exists to protect God-given rights, not grant them. We can change laws, but can’t change the heart of man. Government can’t truly heal brokenness, only Jesus can, so we must put our trust in Him if we want to see our families and communities thrive. That perspective ensures I don’t look to Government for every solution, otherwise we would have 100% taxes and 0% freedom. Lastly, I always try to treat others with kindness and find common ground whenever possible. Most people want the same outcome, but differ on the approach. Do you think our state government is healthy and successful? If not, what would you do to change that? Mark Meckler, president of Citizens for Self-Governance, debated the merits of a Convention of States with those who are concerned about it on Dec 7, 2016. Click to watch! Ballot Measures and Voting Guides! Here’s the voter guide by Dakota Voter covering District 6 candidates and asking them questions about many important issues. Amendment R – Create an independent board for tech schools. Grows government but supposedly more economic development. Amendment S – Amends constitution to add victim rights into constitution. Stronger requirements for notifying and including victims in criminal process. Some law enforcement have concerns it goes too far. Amendment T – Terrible. Politicizes redistricting process. Amendment U – Unbelievably slimy payday lenders’ fake 18% cap, invalidates IM21 and gives free reign. Amendment V – Very bad, help politicians deceive voters about their party affiliation to get elected. Measure 19 – Correctly adjusts some deadlines for petitions, but bans Rep and Dem voters from nominating independents. Measure 20 – Small fix to youth minimum wage, helps more youth get hired which is important for job skills. Measure 21 – 36% cap on payday loans – I’m voting yes. Measure 22 – Heck no! Taxpayer funding for politicians campaigns, increases political advertising, costs $11 million. Measure 23 – No way. Less money in your paycheck, forced unionization. One of the most contentious issues of the last legislative session was debate over teacher pay. As it was so heated, many misperceptions and mistruths arose. For this purpose, I want to clarify my position to you on this important South Dakota issue. I was, and still am, resolutely in favor of raising teacher pay. I strongly supported SB 131, the governor’s bill that ensured school boards prioritized raising teacher salaries to an average of $48,500. This bill sent more money from our general fund to schools, with the result being increased teacher pay and a $62 million increase in overall education funding. South Dakota ranked 37th out of 51st in the nation for education funding, but we stood dead last in terms of compensation for educators. SB131 was the Governor’s solution. It sent more money to schools, and put in place methods to ensure that more money went directly to teachers. During the legislative session I replied to many e-mails, wrote newspaper articles, and did interviews to clearly communicate my position on this topic. It is sad to realize that media and lobbying organizations were willing to mislead educators on this topic. In recent conversations I have discovered how much this deception still lingers, and it is important that you know the truth. SB131 – A bill to increase teacher pay by $62 Million – The main bill. Increases teacher pay. Passed overwhelmingly. HB1182 – A bill to increase sales tax by $107.4 Million – Just one option. Increased tax revenue. Doesn’t increase teacher pay. $80 Million – Governor’s proposed budget increases before tax increases and teacher pay, based on increased revenues. $972 million – State tax exemptions, over $50 million of which I supported eliminating. If we are going to raise taxes, this is how it should be done. Unfortunately for our teachers, supporters of an increase to our state sales tax, found in HB 1182, mislead voters by portraying this tax hike as the bill that increased teacher pay. These supporters (including the SDEA) slandered opponents to this bill as opponents of increasing teacher pay. Then they sent educators to Pierre to lobby for this bill, telling them it increased teacher pay. Sadly, not one of the educators I talked to in Pierre had read 1182, and never heard of 131. The Governor gave the option of funding 131 either by using existing funds, requiring less spending in other areas, or by increasing taxes via 1182. It’s fine if some legislators want to increase taxes and spend more on other areas. But it is wrong to lie to teachers, ignore 131, and tell them that 1182=Teacher pay, which was completely false. Many media outlets advanced this narrative, ensuring that the supporters of HB 1182 effectively silenced people like me, who were actually in favor or raising teacher pay without an unnecessary increase to taxes. The fact is, 1182 as introduced said nothing about teachers or salaries, precisely because it only dealt with tax rates. Even after weeks of teachers being sold on a disinformation campaign that 1182 increased teacher pay, and with the gallery filled with those who were told that opponents of 1182 were against teacher pay, there still were not enough votes to pass the tax increase, since it wasn’t required for the teacher pay increase. Remember, teacher pay was not even mentioned in the bill. So, minutes before the vote, an amendment was added that said “sixty-three percent shall be dedicated to increasing teacher salaries.” This did nothing to change the fact that the actual teacher pay bill (SB131) which spent $62 million to increase teacher salaries, could have been funded by the $80M increase over our previous budget, OR by redirecting video lottery funds, OR by eliminating tax exemptions for special interest groups, OR by making better use of reserve funds. Most people do not even know that we began the session with $80 Million more to spend than the previous year without any new taxes. I was an advocate for funding education first. You may ask, why not just support the tax increase? There are over 34 professions in this state that are 51st in pay compared to the national average. We owe it to those families in our district to look at every possible funding option before we further increase taxes, which was, in fact, the exact directive given by the blue ribbon task force. Tax increases like these could increase jobs in education, but they cause job losses for those who are even worse off than teachers. Is that fair? If we absolutely need increased tax revenues, we should start by examining the $972M of tax exemptions we currently have. Many are legitimate, but many are not. Should I take the easy vote to fleece the low income taxpayer, because lobbyists for the tax exemptions are too influential and legislators don’t have the spine to say no? That’s actually the problem with politics today. I won’t do that. The tax increase bill should not have been voted on before voting on the teacher pay bill. This unnecessary conflict only served to confuse the issue, damage reputations, and increase taxes that disproportionately harmed those with lower incomes. The anger and fear created by those intentionally misleading educators about the vote on the tax increase was wrong and unnecessary. The overwhelming majority of legislators favored funding teacher pay. It is our duty to examine all revenue sources and set the best priorities in our four billion dollar budget. I will continue to do this in the next legislative session if elected, as well as continue to fight for higher pay for undervalued South Dakota professions. Having been a substitute teacher myself and experiencing firsthand the challenges educators face today, I know how important good teachers are to the development of this generation and the success of society in the future. I am committed to working to empower you to work together with parents and have the resources and freedom you need to fulfill this mission to the best of your ability. I want to thank educators for the work you do, and I have always been eager to meet in person or via phone to hear your perspective, answer questions, and learn what I can do to empower you for success in your mission. I look forward to talking with you. It’s January, and that means the South Dakota Legislature is back in session. The two proposals with the largest fiscal impact are proposed changes to the education funding formula and the Governor’s proposal to implement the Affordable Care Act in South Dakota and expand Medicaid. The current education funding formula is a long-standing but complex mix of sales tax and property tax (referred to as state aid and local effort) based on a per-student allocation. The new formula would maintain the state and local mix, but instead target staff to student ratios and teacher salaries. In addition, it maintains local control over teacher salaries so school districts will still be able to adjust in the ways their specific needs require. Under our current education system and salaries, we have about one applicant for every job opening, when averaged statewide. Any business owner knows that you are not attracting and retaining the top talent with that ratio, and to reach the target salary of $48,000 it will require $62 million in additional funding. The Governor has proposed increasing the State Sales Tax rate from 4% to 4.5%, an increase of 12.5%, in order to make up the difference. This would put additional strain on low and fixed income citizens, and I believe there are achievable solutions using current revenue growth combined with cutting fraud and abuse in the healthcare portion of our state budget. Voters have repeatedly rejected new taxes even when focused on education, which means they expect us to prioritize and economize just like they are forced to do with their own budgets. Every year there are numerous new programs, increases in state department budgets, money spent to “freeze” higher education tuition, and increases in state employee salaries. I believe these noble ideas should have been–and must be–put on hold while we focus on improving our K-12 education situation. Which brings me to the Governor’s proposal on medicaid expansion. There are many health care interests that would like to see an increase in federal money flowing into the state, but there are some brief points of principle on this issue that I consider critical. First, the proposal hinges on the Obama Administration giving us their word that they will finally honor their treaty obligations (which require them to cover 100% of the health care costs for Native Americans) if we implement the Affordable Care Act in South Dakota. This seems a little like bringing someone a helicopter because they promise to release a hostage. But if we resolved just this one issue without expanding medicaid, we would be able to fully pay for the new education funding formula. Second, the expansion would create a new class of dependents in South Dakota–able bodied adults–and create a new incentive for people to move here not for work, but to have their healthcare paid for by the rest of us. Third, the Federal Government does not have the money and would be printing or borrowing half a billion dollars from our children and grandchildren every year to pay for this new entitlement, further devaluing the U.S. dollar. Lastly, South Dakota would become a state with a vested interest in not repealing the “Affordable Care Act,” which ironically, has led to an acceleration in healthcare costs. This has made teacher pay dwindle further as more is spent on health insurance. A new administration may change the law or change the agreement, leaving South Dakota stuck with the bill. 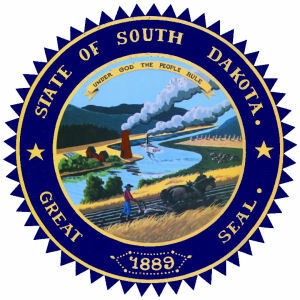 Rep. Latterell can be reached at rep.latterell@state.sd.us or by phone 368-1002. My colleagues and I join with the communities of Harrisburg, Tea, Lennox, and Sioux Falls and extend our prayers today on behalf Principal Kevin Lein, as well as for the students, faculty, and families affected by this morning’s events at Harrisburg High School. We also give thanks to God that no one was killed or more critically injured and we pray for a quick recovery for all involved physically, emotionally, and spiritually. Though his identity and motive have yet to be released, we are also praying for the shooter and for his family. We owe tremendous gratitude and deep respect to the swift, efficient response of school officials, law enforcement and first responders from multiple state and local agencies who executed their coordinated response plans and provided security for students across the district. I am personally thankful that our communities are filled with so many heroes with selfless courage who run towards danger and risk their lives in order to protect others. Thank you to everyone who did their jobs with excellence and courage today and to those who are continuing the work of justice and healing moving forward. It is appalling and inhumane to see the top doctor for the national Planned Parenthood organization admit, on videotape, that Planned Parenthood affiliates and abortionists daily review pre-orders for baby organs and body parts, then tailor abortion procedures to facilitate the harvesting of the baby’s intact parts and organs for resale. Planned Parenthood treats those who enter their facilities not as patients, but as unwitting hosts to produce baby body parts to bolster their bottom line. In light of numerous horrific admissions by Dr. Nucatola and her implication of Planned Parenthood affiliates across the country, I call on Governor Daugaard and Attorney General Jackley to investigate Planned Parenthood of Sioux Falls for violations of S.D. Codified Laws Ann. 34-23A-17 and 34-23A-27. 34-23A-17. 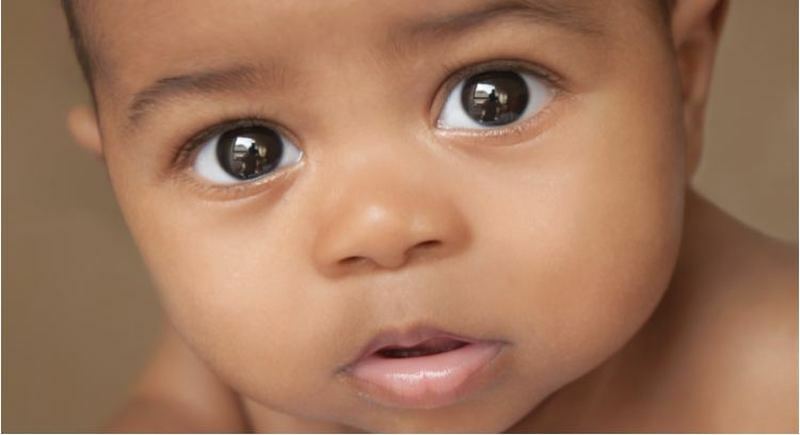 An unborn or newborn child who has been subject to an induced abortion other than an abortion necessary to prevent the death of the mother or any tissue or organ thereof may not be used in animal or human research or for animal or human transplantation. 34-23A-27. No person may perform a partial-birth abortion which results in the death of a human fetus or infant. A violation of this section is a Class 6 felony. Dr. Nucatola specifically describes abortionists manipulating unborn children in order to remove them feet first, to facilitate obtaining an intact head, apparently to preserve an intact brain. This statement and others raise a host of ethical questions, including whether pregnant women are being given detailed information in advance about exactly what is going to be done to them and their babies. South Dakota has multiple facilities that do abortions all throughout pregnancy. Because trafficking in human organs and tissue occurs all throughout pregnancy, S.D. Codified Laws Ann. 34-23A-17 may be violated at any stage of pregnancy. Whether profit is made is irrelevant: harvesting and trafficking of human organs and tissue is illegal. I have repeatedly called for laws banning the dismemberment and beheading of unborn children, procedures which are admitted to on video by Planned Parenthood’s top medical director. Preventing these procedures will prevent the possibility of organ harvesting and trafficking. In light of recent developments, it is all the more important for South Dakota to pass this law. Lawmakers should now be asked whether they will continue to oppose legislation to restrict the dismemberment of unborn children, as Planned Parenthood insists – and if so, whether they are motivated in any degree by a desire to preserve Planned Parenthood’s ability to deliver intact, well-developed baby body parts to order. When we think it can’t be uglier, the abortion industry continues to shock us​ with its violent and evil abortion system, as well as its willingness to disregard the law and lie on their reports to state agencies to increase their abortions and income. South Dakota must take action now to investigate Planned Parenthood and prevent further unspeakable abuse of South Dakota women and their children. I commend United States Congress, multiple Governors, and Attorneys General for beginning investigations into Planned Parenthood’s national, state, and local affiliates. South Dakota’s Governor and Attorney General must do likewise and investigate Planned Parenthood and conduct strict audits of hospitals conducting abortions in our state. Rarely in legislature can it be said that the process is delightful, and rarely does a bill introduced purely at the request of one constituent make it all the way through the process. Last week I had the pleasure to experience both, and witness a brave young lady make South Dakota history! So at the beginning of session, Brock asked for SB 161 to be drafted, with Brock as the Senate sponsor and myself as the House sponsor. 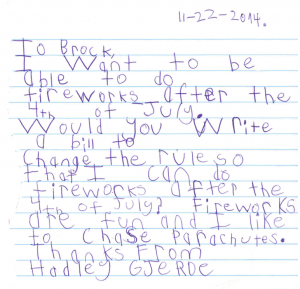 The draft exempted several small fireworks, like sparklers, parachutes, snakes, and smoke bombs, but we tried to address some of the fire concerns, not allowing parachutes with a flare or traveling fireworks. We were presented with the initial draft, and hadn’t heard any concerns going into the hearing so we thought maybe everything was ok. But when we showed up for Senate committee (Hadley testified herself with handmade note cards), opponents came out of the woodwork. It turned out this little six year old caused quite a stir amongst some of the interested parties in Pierre! 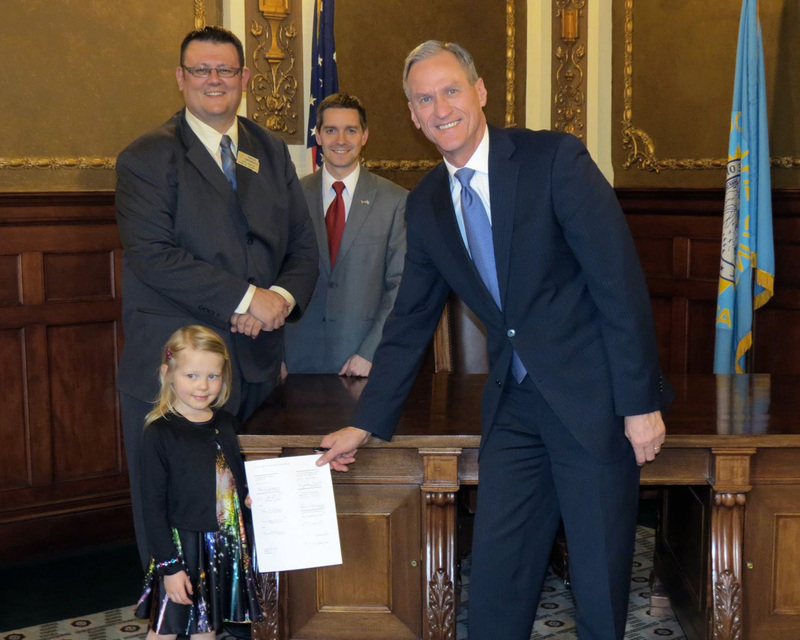 So the bill was amended to remove sparklers, but still accomplish Hadley’s mission, passing committee and the Senate floor. In the House committee, Brock and I, who would normally start off introducing the bill, didn’t hear the chair call the bill number for proponents. So brave Hadley, seeing the need, stepped right up to the plate with her note cards. I believe it was the first time in South Dakota history that a six year old gave the opening bill testimony before a committee. I also testified afterward, but her testimony was so compelling that I was careful to make it as brief as possible! She was a little optimistic when she wrote it, since we weren’t sure it would even make it out of committee. 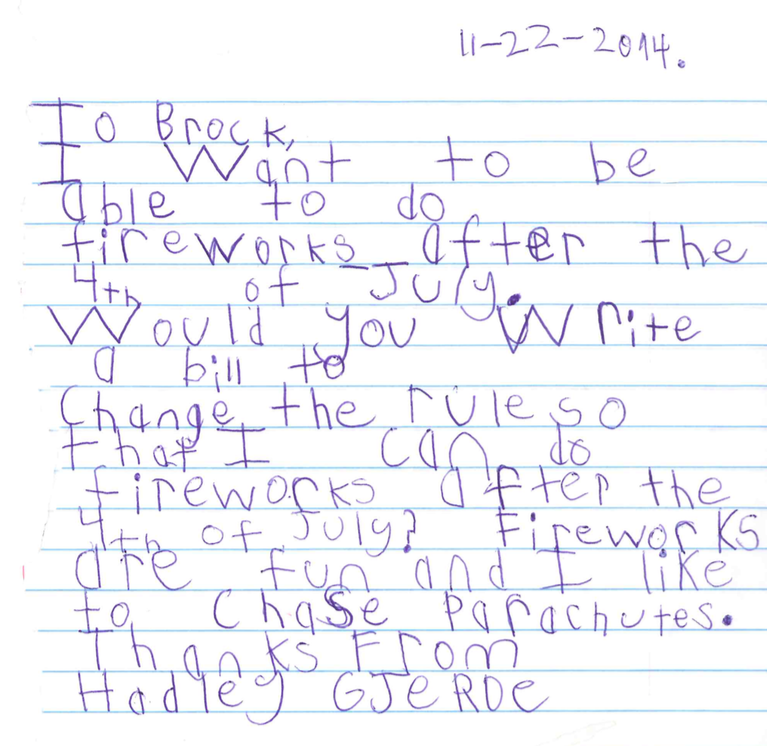 But thanks to her initiative and bravery, Hadley will now be able to chase parachutes with her cousins, who can only come visit her after the 4th of July. In a humorous twist, my district mate Representative Otten sits on that committee and said thank you to Hadley, realizing that because they shoot parachutes after the 4th, his family really needs this bill to pass t00! No state, no religion, and no organization should ever be allowed to use this unspeakably horrifying method. While we rightly take the speck out of our neighbor’s eye by holding ISIS accountable, let us be sure to take the plank out of our own eye by holding Planned Parenthood accountable. Welcome! This is a radio ad I would really like to run the last few days of the election, but I need your help. Would you consider making a contribution of $100 to get this on the radio and help achieve victory? By contributing, you are investing in a government of the people, by the people, and for the people, not beholden to special interests who want to write the laws for their financial gain. Thank you so much for your support, and thank you for visiting! You may also contribute by check to: Friends of Isaac Latterell, PO Box 801, Tea, SD 57064.